If you love me, you will keep my commandments. And I will pray the Father, and he will give you another Counselor [in the Vulgate, Paraclitum], to be with you for ever, even the Spirit of truth, whom the world cannot receive, because it neither sees him nor knows him; you know him, for he dwells with you, and will be in you. But I also fulfill my duty, since all living things are set ablaze from me; and I am uniform life in eternity, which has neither beginning nor ending. God is this life, working and moving itself, and yet this life is one in three forces. Therefore Eternity is called the Father, the Word is called the Son, and the breath connecting these two is called the Holy Spirit, just as God is signified in human beings, in whom are body, soul, and reason. 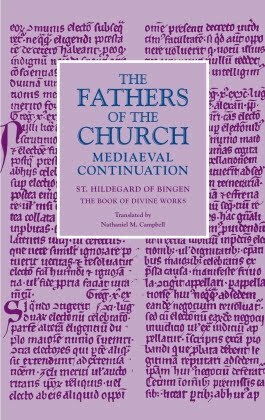 This wide range of images is condensed in this simple antiphon into two key concepts—or perhaps, given the fact that most of Hildegard’s music was likely composed before the Liber Divinorum Operum, it might be better to say that, from the simple articulations of this antiphon was spun the complex web of Caritas’ powerful visionary appearance at the opening of the latter work. Each of these two key concepts is enunciated by a superlative adjective (a construction in which Hildegard revelled and whose rhythms are far more poetic in Latin than in English): Love embraces the cosmos as excellentissima (“most excellent”; in its etymology, the Latin concept of excellence relates to loftiness and height), and God, her royal spouse, as amantissima (“most beloved”). The first half of the antiphon celebrates the exalted reach of Divine Love from the depths of the abyss to the heights beyond the stars. Because the subtle immensity of her being is the dynamic structuring principle of all levels of created being (habundat in omnia), she connects every link in the neoplatonic chain of being, overflowing from the Divine Source into each successive level. Love’s fundamentally connective office then transforms in the second half of the antiphon into the tender relationship between lover and beloved. While this imagery is classically scriptural, Hildegard here has assimilated a verse from Psalm 85 to reverse the imagery of the opening of the Song of the Songs. While the Bride cries out, “Let him kiss me with the kisses of his mouth!” (Sg. Sgs. 1:2), in Hildegard’s antiphon, it is Caritas who reaches herself up to kiss the High King with the kiss shared between Justice and Peace in Ps. 85:10 (84:11 in the Vulgate). The music itself highlights Love’s active giving rather than passive reception by repeating the opening phrase on Karitas almost note-for-note in the long final melisma on dedit ("gave"). As we already saw in yesterday’s antiphon, the dynamic paradox that animates the Spirit’s office is the tension between a rooted omnipresence that structures the world—denoted here in the first of the antiphon’s two verbs, habundat—and the constantly moving dynamism of the Spirit’s activity—denoted here in the second verb, dedit. In its guise as Caritas, the Holy Spirit is an active agent of peace—the harmony in and for which the world was created. That harmony is further reflected in the pervasive homoioteleuton, or repetition at the end of words, of “a”—again, another feature seen in yesterday’s Spiritus sanctus vivificans vita. As Marianne Richert Pfau has noted, the intense repetition of “a” and “i”—the two vowels of the word Karitas itself—becomes wholly intertwined with the musical structure of the piece, in which five (or six, if you include the initial word Karitas) of the eight musical phrases ends on the homenote D and with the end-vowel “a” (omnia, excellentissima, sidera, amantissima, and omnia). The final two phrases are the exception—but in this case, the variatio proves the rule. The penultimate phrase ends with pacis and, rather than returning to D, remains high on A, pressing the melody onto the final phrase—a melisma on the first syllable of dedit—which begins and ends on D while ranging the full octave up to d.
The repetition of final vocalic “a” and its marriage with the musical return to the homenote of D confirms the thematic structuring of the piece around the two superlative adjectives, which are further highlighted by the range of the music in which they are set. The two musical phrases that contain de imis excellentissima / super sidera also contain the broadest range of the entire piece, from the first appearance of the high d as the third note of de down to the low A on the first syllable of super (repeated on in omnia in the line after next), thus musically mirroring the breadth of Caritas’ ontological dynamic. This antiphon’s meditation on the Spirit’s manifestation as Lady Love sets the stage, as it were, for the more intricate explorations of the Spirit’s activity within the world in the sequence and hymn we will examine later this week. Let us rest today, however, with the paradoxically simple image of this powerful and dynamic Love of God.